The Infiorate is a flower festival to celebrate the Corpus Domini feast, which takes place on the ninth Sunday after Easter. The ancient Umbrian town of Spello pays homage each year by creating beautiful floral tapestries to celebrate the Eucharist as the body of Christ. 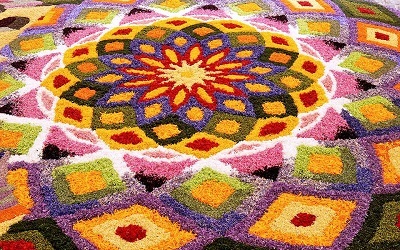 The Infiorate is a custom where groups make carpets entirely out of flowers that decorate the procession route. This event dates back centuries, but the current artistic form where the streets are covered with flower petal rugs took place in the early twentieth century. Italian poet, Dante Alighieri once said: "Nature is the art of God." The people of Spello use a part of nature to create colorful works of art expressing their devotion. 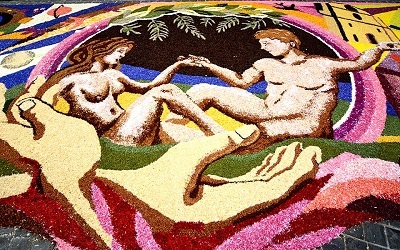 Preparation for this event takes place throughout the year as the infioratori chose their design and determine what flowers they will need to make it a reality. Teams will set out along the slopes of Monte Subasio, which is a part of the Apennine mountains, and through the fields of the Umbrian valleys collecting the flowers. This process occurs during each of the seasons as flowers bloom during different times, but spring is the most demanding season. The flowers are then cleaned, preserved and stored until they are needed on the eve of Corpus Domini. On the eve of the feast the streets of Spello are closed to traffic. Groups work to put up lights and tents to protect the road surface from the elements that can hinder the creative process. Once this is in place teams come in and set up shop on the area of the street that is designated for them. 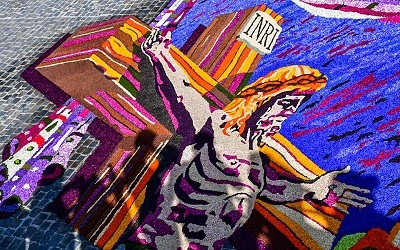 The infioratori will use different techniques from freehand drawing to use of templates to layout their intricate design ranging from geometrical shapes to religious scenes onto the road. Once the drawings are complete, they will start to fill in the canvas with their colored petals. Millions of petals, dried and fresh, are used to create these artistic master pieces. Infioratori work throughout the night filling in the canvas and making sure everything is perfectly arranged. When they are all done the streets of Spello are transformed into a beautiful work of art. Not only are you motivated visually with over 60 different floral displays that extends approximately one mile, you are stimulated by the aroma of the flowers. 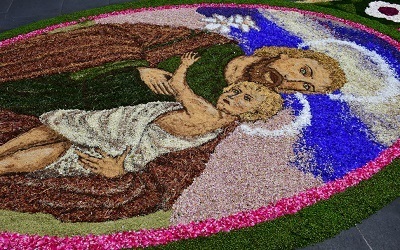 The infioratori must have everything done by 8:00 am on Sunday because each floral carpet needs to be judged before the procession, which precedes the 10:00 am mass. The best time to see these works of art are early in the morning before the crowds get bigger. You will be able to stroll down the street and look at each design and admire the incredible detail and amazing work by these artists. 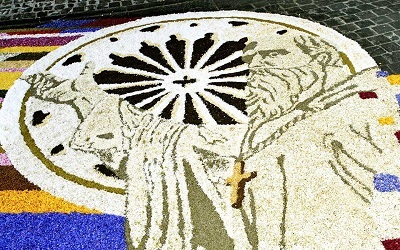 Following mass, the procession begins, and these floral carpets become the path that the Bishop will walk as he carries the monstrance, which holds the Eucharist. Once the religious celebration is over you can take one last stroll along the route capturing photos of these lush fragrant carpets before workers come in and clean the streets. Later in the evening everyone will gather at the piazza as prizes will be awarded. Each group listens with excitement hoping that their floral masterpiece will be chosen as the winner. The town has a museum dedicated to the Infiorate located in the Piazza della Repubblica, which details the history of the event including photos throughout the years.